John VIII Palaiologos or Palaeologus (Greek: Ἰωάννης Παλαιολόγος, translit. Iōannēs Palaiologos; 18 December 1392 – 31 October 1448) was the penultimate reigning Byzantine Emperor, ruling from 1425 to 1448. The second marriage, arranged by his father Manuel II and Pope Martin V, was to Sophia of Montferrat in 1421. She was a daughter of Theodore II, Marquess of Montferrat, and his second wife Joanna of Bar. Joanna was a daughter of Robert I, Duke of Bar, and Marie de Valois. Her maternal grandparents were John II of France and Bonne of Bohemia. 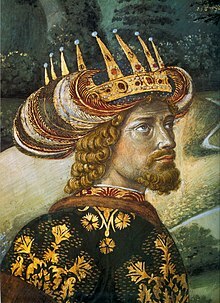 John was the last Roman Emperor to both have an Empress consort and multiple consorts as the wives of his brother and only successor, Constantine XI Palaiologos, had died before he became emperor in 1449. Portrait of John VIII Palaiologos from a manuscript at Saint Catherine's Monastery circa 1440. Piero della Francesca's Flagellation, possibly depicting John VIII Palaiologos as Pontius Pilatus (the leftmost figure). Device of the Emperor John VIII Palaiologos, featuring the double-headed eagle with the sympilema (family cypher) of the Palaiologos dynasty. This article incorporates text from a publication now in the public domain: Chisholm, Hugh, ed. (1911). "John VI or VII" . Encyclopædia Britannica. 15 (11th ed.). Cambridge University Press. p. 439.